Will These 100 Artists, Let Alone Works of Art, Define Us? It takes a lot of nerve, and the willingness to be wrong, incredibly wrong, to write the book that Kelly Grovier published in the U.S. this month (and in September in the U.K.). It’s called 100 Works of Art That Will Define Our Age, and it’s a list of paintings, sculptures, drawings, installations, performances, and video pieces, made between 1989 and the present. Grovier is “an American poet, historian, and art critic,” according to his Wikipedia page, and “contributes regularly to the Times Literary Supplement and is co-founder of the scholarly journal European Romantic Review. He was born in Michigan and now lives in England,” according to his description on Amazon.com. Accessible and incisive texts offer a biography of each piece, tracing its inception and impact, and showing how it provides a unique keyhole not only into the imagination of the artist who created it but also into the age in which we live. You will know some of them, by the likes of Christian Marclay, Matthew Barney, Shirin Neshat, Pipilotti Rist, Nan Goldin, Jeff Koons, Cy Twombly and Xiaogang Zhang — in fact, the BBC has a slide show of works by those eight that were selected. And many others are predictable (Abramovic, Hirst, Emin, Gursky, Viola, Holzer, Kapoor, on and on). Yet, I was surprised by others — I not only didn’t know the works, I don’t know the artists. Take a look yourself — T&H published a list of the artists in the book. Predictably, the list is SO heavy on British artists and, in particular, the YBA. The usual suspects. Ho hum. Having purchased and read the book, I don’t disagree with your statement that it takes a lot of nerve and willingness to be wrong to produce a book that is so presumptuous any more than I would disagree that someone writing a pseudo review of anything without actually reading/seeing it could be taken seriously. Heavens, this is NOT a review — or a pseudo review. 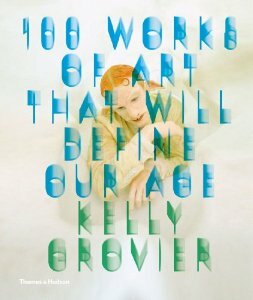 This post aims only to flag the book for RCA readers and direct them to the list of artists, not the works chosen by Grovier. …and just in time for the holidays!